The Lewis University Library and the Office of Multicultural Student Services invite you to join us in celebrating the freedom to read! When: Tuesday, Sept. 26, from 12:30-1:45 p.m.
Sign up here to be a reader! Banned Books Week is an annual, nationwide event celebrating the freedom to read, and this year’s theme is diversity. Books with diverse content (including, but not limited to, LGBTQIA, people of color, gender diversity, people with disabilities, and ethnic, cultural, and religious minorities) are generally overrepresented among banned and challenged books; in fact, in 2016, the five most-challenged books all fell into this category. 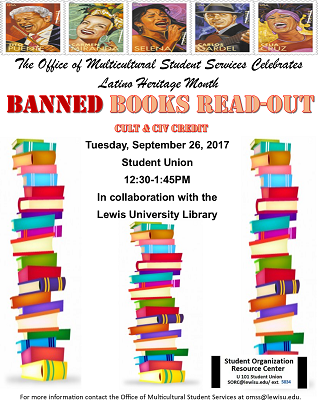 To bring awareness to this national week of advocacy, and to commemorate Latino/a Heritage Month, we are hosting a “read-out” featuring banned and challenged books, and we’d love for you to participate! Select your favorite Banned Book (get ideas here! ); either bring your own copy or borrow one of ours; and read aloud from it for 5-10 minutes. WHAT IF I WANT TO PARTICIPATE, BUT I DON’T KNOW WHAT TO READ? Check out this list of Banned Books with diverse content. We’re confident you’ll find something that resonates with you! Sign up here to read at the Read-Out! Questions? Contact Lindsay Harmon at harmonli(at)lewisu(dot)edu or (815) 836-5672.